I found a great deal on Craigslist for a new-in-box Frigidaire ceramic top Cooktop. I got this for only $300! Wow! And I was able to pick it up on our anniversary! I got home and pulled out our old cooktop. It was one of the ones with the spiral elements and icky drip pans that attract spills faster than a sugar-spiked toddler. Removing the old one was pretty easy. It was only held in by the electrical connection and a bead of silicone caulk around the mounting flange. The silicone cut pretty easily with a paring knife. The electrical connection wasn't bad. Ty suggested that I turn off the circuit breaker. 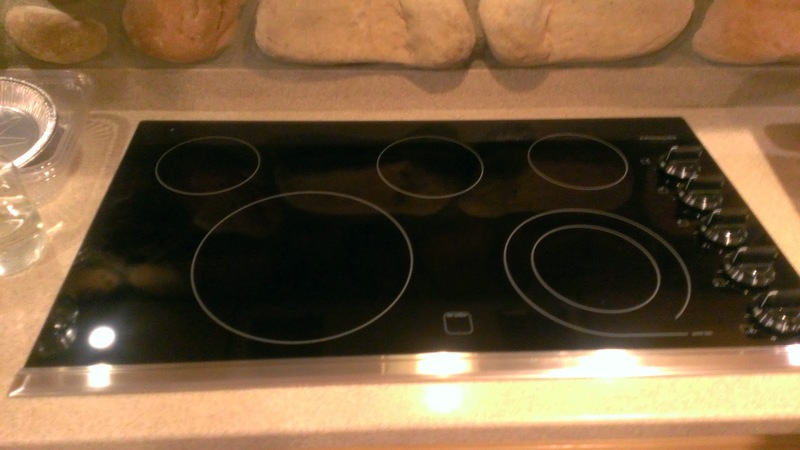 I suggested that if we left it on she could use the life insurance to have the cooktop professionally installed. She LOL'd. I turned off the breaker. There were 4 wires in the box; two hot, a neutral, and ground. All were secured with giant wire nuts. I unscrewed them and baggied the wire-nuts for later use. The metal armored cable that protected the wiring was held on by a clamp that opened with one screw. Easy-Peasy. I hit a snag. It didn't fit. Ty was not pleased. I think she might have briefly reconsidered the circuit breaker idea. Oops. So, what to do? Make the hole bigger of course! 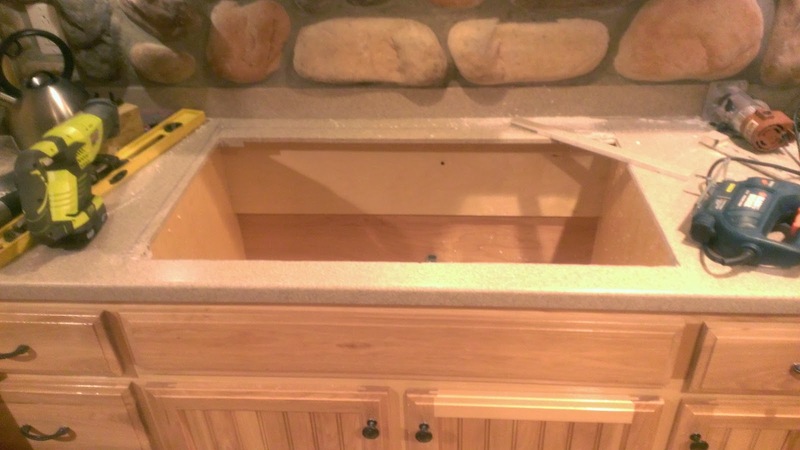 Our countertops are a plastic composite, probably Corian. As it turns out these can be cut with standard power tools. Ty was not ecstatic about the idea of chopping a hole in our countertops on the day before the day before Thanksgiving. I tried a few different ways to cut it with varying success. Ryobi Cordless Drill: Easily drilled a 1/2" starter hole for the spiral cutter. 10 year old Homier trim router and Spiral cutting bit: Cuts like butter. (Until the router ate the brushes in the motor and self destructed.) This is the tool I'd recommend if you have a choice. 10 year old Black and Decker Jigsaw: Cut 70% of the hole with this. The corners of the cooktop were reinforced with a double thickness of Corian. This was incredibly difficult to cut through. Each corner took at least 10 minutes to cut. This is probably the last job this tool will ever do as it was seriously limping by the end. I think the brushes probably went on it too. Ryobi Cordless Reciprocating saw: This cut through the back edge where the jigsaw couldn't fit. It cut at about the same speed as the jigsaw, but it shut down after about a foot of cutting. I switched to the other battery to finish the job. I think the batteries have an internal temperature monitoring circuit, because it was fine after I let it cool down for a while. Idea: Ryobi (or some intrepid adventurer like me) should make a plug-in module that lets you use the tools as wall-powered. It'd be great for jobs like this when power is literally inches away and save wear on the (ridiculously expensive) batteries. Note: You should round the corners of the Corian when you cut them. Sharp corners concentrate stress and can cause cracking. Cracking is bad. The manufacturers website had this plastered all over the instructions, so I assume it's important. One-and-a-half broken tools later and the new hole was cut. 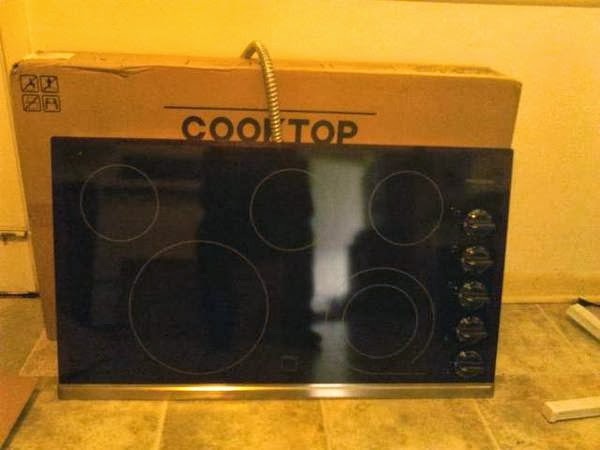 The new cooktop dropped right in. It came with two brackets that mount underneath to keep it in place. This seemed odd, as it seemed unlikely that it could fall "up" out of the counter. I installed them anyway. The electrical connections were well documented in the manual. Easy as pie. I double checked the circuit breaker just in case Ty had reconsidered her earlier position. Not easy was cleaning up the explosion of plastic dust swarf everywhere. This is not a tidy job, by any means. Here it is. It's straight, just the angle of the picture makes it look uneven. Note: I'm not sponsored by any of the companies I mention. I mention the brand names here because a lot of tools are junk, and I see value in knowing what actually works.